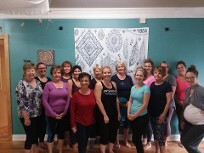 Some of the ladies from Chair Yoga! Level 2: Some movement. Mostly holding poses. Level 3: Movement, holding poses with light cardio. Level 5: Fast movement with a high volume of cardio. "Yoga is the dance of every cell with the music of every breaath that creates inner serenity and harmony." Special Offer for first time visitors- $20 for 14 consecutive days of unlimited classes! Acu-Yoga: This class uses acupressure points and meridian energy lines to release the stress held in the body subconsciously. 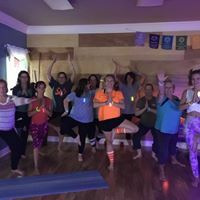 This is a candle-lit calming class using energy medicine. 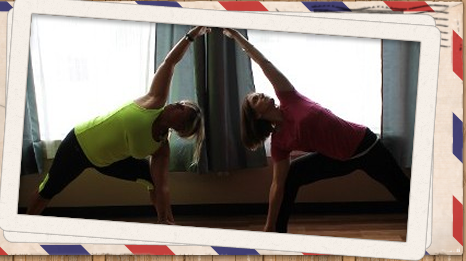 Athletic Yoga: Focuses on gaining strength, flexibility, and stamina. Poses will be held at times and also flow from pose to pose. Breath+Flow: This class uses breath and movement to align the body and mind. The elements of earth are integrated into our practice: fire, air, water, earth, spirit. You will sweat, you will get a work out, and you will leave refreshed and renewed. Sri Yantra Sweat: This class will help you to move with within the Merkaba of the body. You don't just have one side to your being. You are multi-faceted. This practice will help to UNITE as a whole! You will MOVE, SWEAT, and you will shake off any bad vibes. 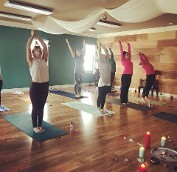 CHILL Yin Yoga: This candle lite class is a slow paced yoga class using simple floor-based poses that help you get deeper into the connective tissues of the body. The class is designed to release any tension within the body and mind. Energy Chair Yoga: The perfect class for yogis that may have challenges with getting up and down off of the floor, standing for long periods, or mobility. The class modifies poses and uses the chair as a prop and also a seat. You will gain strength, flexibility, and balance while relieving stress. Fusion Yoga: A combination of all styles of yoga. The practice is designed around the students who attend the class. Introduction to Yoga: This class Introduces the students to form, breath, and grounding by breaking down the poses. Restorative Yoga: It helps with relaxation and stress relief. It assists in centering your breath and body with gentle movements and poses. Slow Flow & go: A combination of energizing flow followed by relaxing restorative postures. Vinyasa Yoga: A sequence of poses that have fluid movement with smooth transitions from pose to pose. This class focuses on the connection of breath and body. It will assist with gaining strength, flexibility, and stamina but is more gentle then athletic yoga. Yin Yoga:The class is designed to relax your muscles and create space within your joints. Poses are held between 3-5 mins and done mainly on the floor. The class assists in lengthening muscles, relieving stress, and improving focus. YinYasa Yoga: A combination of Yin and Vinyasa. You will flow through poses but also hold them for longer periods of time. Zen Energy Flow Yoga: A combination of Meditation, energy medicine, Montras and flowing yoga poses. You will gently move your body while connecting to your prana. Each class has a different focus. Himalyian bowls, crystal bowls, chimes and essential oils are often used during class. One on one training with a certified personal trainer. These sessions are developed around YOUR needs and schedule. Whether it be strength training, cardio, core work, balance, weight loss or a deeper yoga practice, let us help you reach your fitness goals. Kriya offers 30 min, 45 min, and 60 min private or semi private sessions.